Learn how to keep a garage cool in Arizona, Florida or Texas or how to keep a garage cool in Summer in 2019 by using this garage cooling guide. Furthermore, Alternative Energy, LLC is a team of full-service energy contractors with decades of combined energy saving experience and know all about cooling down homes and garages in the Phoenix, Arizona valley, Miami Dade County, Fort Lauderdale & Broward County, Florida. We not only offer informational content to help you find ways to cool your hot rooms, but we also offer energy services to help you get it done! A lot of our garage cooling customers use their garage as a workshop all year long. Some use it for working on cars or home improvement projects, while some may use it for gardening tasks or other miscellaneous reasons. In either case, if you are someone who uses your garage for more than just parking your car, this article should help you learn how to cool down your hot garage. Read more about cooling garages in Arizona & Florida below. CALL TO COOL YOUR GARAGE TODAY! 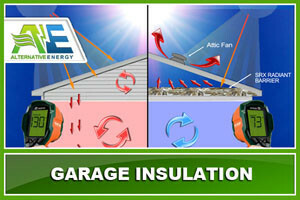 Garage attic insulation, also known as, garage radiant barrier is important to keep out the heat. Arizona, Florida & Texas summers get up to 120 degrees Fahrenheit and working in a garage with no AC can send temperatures rising even higher. Garage insulation is a must if you want to at least stop most of the heat from making its way in. Our SRX insulation is perfect garage attics and garage doors. SRX is best insulation for hot climates like Arizona, Florida & Texas. Installing garage radiant barrier will cost you about $500 for a 1 car garage and about $800 for a 2 car garage. In general, it costs about $2 per sqft to install garage attic insulation. However, insulating your garage will do a great job at keeping out most of the heat, but you are going to need a way to cool down the space as well. That’s where garage air conditioning comes into play. Before we get into that though, lets talk a little more about insulating your garage door. SRX radiant barrier was actually invented to keep homes cool. It has the capability of saving you 50% on electricity guaranteed! The great thing about our new radiant barrier technology is that it will never stop working like current radiant barrier technology does. SRX solves all the current problems with radiant barrier technology. 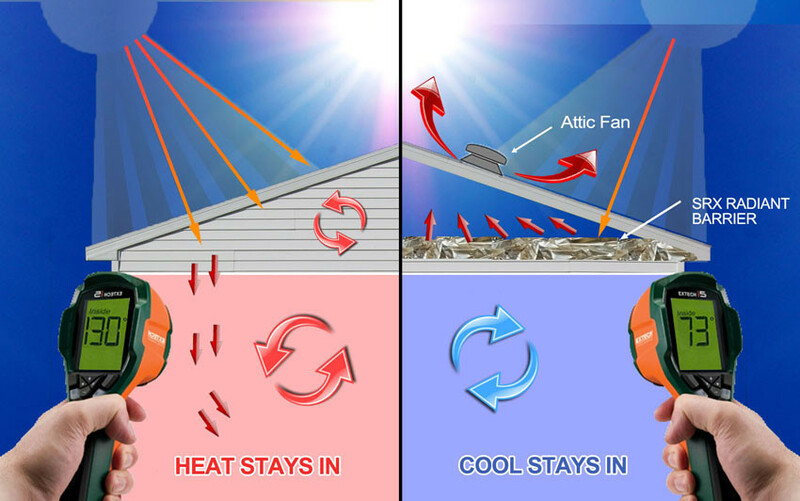 Installing radiant barrier in your home’s attic is a great way to lower the costs of cooling and heating bills during the summer time in Arizona, Florida & Texas. Plus our SRX insulation will make all the rooms in your home the same temperature, make your A/C unit run more efficiently and keep your home warm during the winter time too. We can perform a free home energy audit while we are installing your garage door insulation, garage insulation and garage mini split. You need garage air conditioning to cool your garage cool in Arizona, Florida & Texas. Most garages in the Phoenix Valley weren’t built to have an air conditioning unit or a ventilation system. That’s where the energy experts come into play. We have the capability of installing garage mini split systems, also know as ductless garage ac units, in your garage, that only need a single port of ventilation, that can cool down the space quicker than any portable air conditioning unit could, and with a cleaner installation. Installing a mini split system for your garage will help you get the temperature down in the space and your garage insulation will keep the cool air in longer. 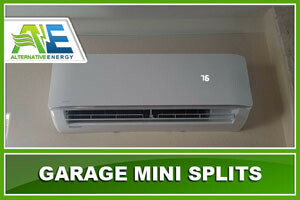 These mini split systems are great for small spaces like garages and can cool down an average size garage in about 15 minutes. Not even a swamp cooler or portable ac unit can cool a room down that fast. This is the fastest way to cool down a garage in Florida, Texas & Arizona. Fans just blow the heat around. You need something more powerful during the summer to cool down the space. Install SRX garage insulation first, then a mini split to keep the space cool. The mini split won’t even have to run very long because SRX will hold the temperature of the room like a thermos. Can’t I Just DIY Install A Mini Split System In My Garage? Yes, with the right tools you can install a mini split system yourself. Although, we strongly urge you not to try to do so. This job involves cutting, electrical work and more. This is dangerous for the average homeowner and is not an easy task to perform DIY. We suggest hiring a professional ductless ac installer such as ourselves to install your mini split system for your garage. 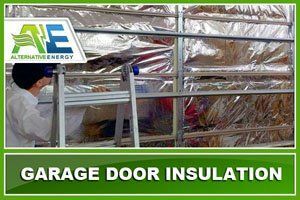 Installing garage door insulation is the most important step for cooling a garage in Arizona, Florida, or Texas. Your garage door is where most of the heat escapes due to no insulation in the door. Insulating your garage door is an important step if you want to keep all of that cool air in. If you do not insulate your garage well, the air will escape, take longer to cool down the space and cost you additional money in cooling bills. The utility bill for your home is already high enough, why not save a little money and still keep your entire home cool? On average, insulating a garage door costs about $100 for a 1 car garage and $250 for a 2 car garage. 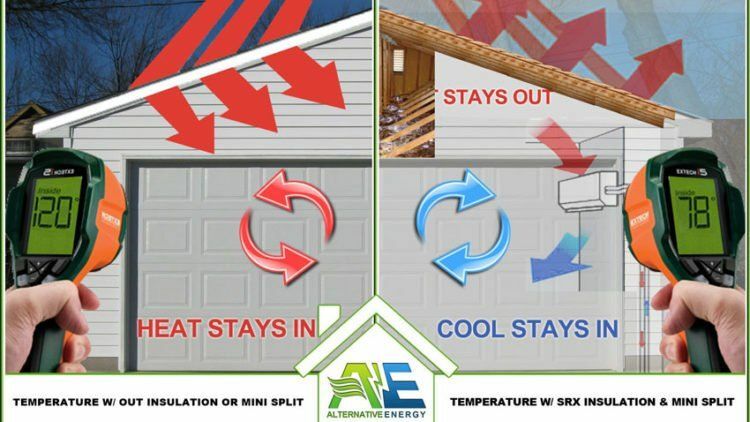 Not only does SRX work for your garage attic and garage door insulation but it also works for your home. Installing SRX in your attic is guaranteed to save you at least 20-50%. Furthermore, if you choose to go with other energy products, you could save up to 100% of electricity. Yes, We said 100% Guaranteed!!! Can’t I Just Install Garage Insulation or Garage Door Insulation Myself? Yes, you can absolutely install your garage insulation yourself. Although, will you be sure that you are doing it correctly? Do you know where to look for the places the air seeps in the most? Do you also have the capabilities of installing the next part of the job that actually cools down the space (mini split system)? If the answer is no to any of those questions, you should hire a professional insulation or radiant barrier contractor such as ourselves that has decades of experience with installing insulation in garages. 4. Hire A Professional Energy Company For Garage Cooling Services! The best way to cool a garage in Arizona, Florida, or Texas is by hiring a professional energy company to cool your garage for you. Energy companies know exactly the right areas to target to ensure proper garage cooling efficiency. Alternative Energy, LLC has created the ultimate garage cooling package that allow you to keep your garage cool all summer. Our service area includes Phoenix, Arizona Valley, Miami Dade County, Broward County, Tampa Bay, and San Antonio. Give us a call or fill out our contact form to receive a free energy audit which will determine the best solution for solving your garage cooling problem. *APS & SRP customers click the link to learn how to lower your electric bill in Phoenix, Arizona. Here are a few other ways to keep a garage cool but as we mentioned in the article above, the only way to keep your garage cool efficiently is to install insulation and a garage ac unit. We offer free energy audits to the entire Phoenix Metropolitan Area including: Phoenix, Mesa, Tempe, Gilbert, Chandler, Surprise, Peoria, Glendale, Scottsdale and more. Also serving San Antonio, Texas. Broward County Florida including: Fort Lauderdale, Pembroke Pines, Hollywood, Miramar, Coral Springs, Pompano Beach, Plantation and Sunrise, Florida. Miami Dade County Florida including: Miami, Hialeah City, Miami Beach, Homestead, North Miami, Coral Gables, Doral City, North Miami Beach and Cutler Bay, Florida. Bay County Florida including Tampa Bay. Give us a call if you do not see your city listed. Also, see our latest post about how to keep a garage cool with no windows.